Engineered from the ground up to go Beyond Boundries..
We incorporated some twisted IRO ideas with some conventional suspension design logic and came up with the TJ Premium Long Arm Kit. Where others are lacking, IRO has stepped up and delivered a feature packed, precise performing system. Fully Adjustable 3 Link Front - The only limit to your non-binding suspension setup will be the length of your shocks. All 3 links are independently adjustable allowing an infinite range of axle positions. Adjustable Double Shear Front Track Bar - This unique and carefully designed feature works with your 3 link front to center your axle. Jam nut free design will never clunk. 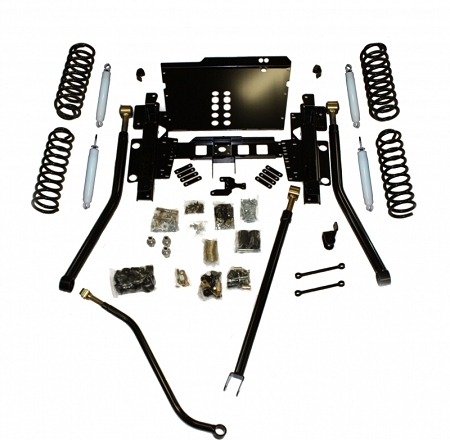 LCG Compatible - The front suspension and track bar require no lift and no bump stop extensions to work! The rear requires only 3" bump stop extensions. Extremely High Clearance Belly Skid - Go from approximately stock location all the way up to completely flat with the frame. Modular Mounting System - Independent transmission mounting crossmember allows the belly skid to be easily removed while leaving the transmission/transfer case securely bolted in place. Additionally, you can remove the transmission crossmember and leave the suspension completely installed and untouched. Innovative Transfer Case Linkage Bracket - The first and only system that mounts entirely to the transmission (no more body side mount to cause issues or come apart under flex). 2" x 5/16" wall D.O.M. Lower Control Arms. Pure beef you expect from IRO. NO JAM NUTS - All adjustable links utilize IRO's exclusive threaded clamping terminals. It is highly recommended to use a slip yoke eliminator with this system. IRO recommends the Mega Short. 1" motor mount lift is highly recommended. Installation requires cutting grinding and welding.